Erect, slender-branched shrub, stems 0.5-1.2 (2) m tall; young twigs covered with coarse reddish hairs; bark peeling. Alternate, deciduous, thin, in clusters along branches, especially at tips, narrowly elliptic to ob lanceolate, 4-8 cm long, pointed at ends, entire to wavy-margined, yellowish-green, upper surfaces with fine rusty hairs; stalks 5-10 mm long, glandular-hairy as well as coarsely reddish-hairy. In axillary clusters of 1 to 4 on previous year's growth; flower stalks slender, up to 1.5 cm long, glandular-hairy; corollas white, broadly bell-shaped, 1.5-2 cm wide, up to 2 cm long, fused near base, the lobes spreading, nearly equal, entire; calyx divided to the base, the 5 lobes 8-10 mm long, leaflike, hairy with fine, gland-tipped, and some long, reddish hairs; stamens 10, filaments densely hairy on the lower half; anthers egg-shaped, unawned. Capsules, egg-shaped, 6-8 mm long, thick-walled. Dry to wet forests and openings in the montane and subalpine zones; common in C and S BC; E to SW AB, and S to OR and W MT. 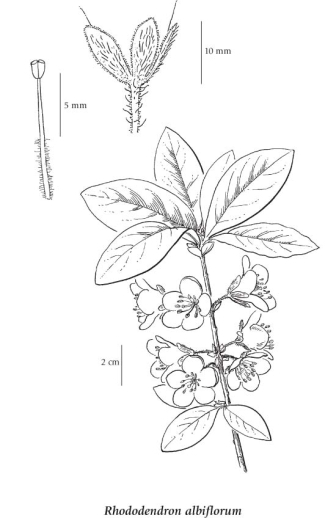 A shade-tolerant/intolerant, montane to alpine, Western North American deciduous shrub distributed more in the Cordilleran than the Pacific region. Occurs predominantly in continental subalpine boreal climates on moderately dry to fresh, nitrogen-poor soils (Mor humus forms); its occurrence increases with increasing continentality and decreases with increasing latitude. Common and often dominant on water-shedding sites in open­canopy coniferous forests in the coast-interior ecotone; often on decaying coniferous wood. Typically associated with Barbilophozia floerkei, B. lycopodioides, Rhytidiopsis robusta, and Vaccinium membranaceum. An oxylophytic species characteristic of subalpine continental forests.